Building on three historic fundraising telecasts in 2008, 2010 and 2012, the groundbreaking grassroots movement Stand Up To Cancer (SU2C), a program of the Entertainment Industry Foundation (EIF), will return to primetime television on Friday, September 5, 2014, at 8 pm ET & PT / 7 pm CT. Returning for the second time as Executive Producers of the September 5th telecast are Emmy-winning producer Joel Gallen, president of Tenth Planet Productions, and Oscar-winning actress Gwyneth Paltrow. Gallen and Paltrow will be joined by the SU2C Production Team to deliver a one-of-a-kind show featuring performances from top recording artists and celebrities from film and television, engaging viewers with powerful stories of remarkable progress being made by SU2C-funded research. ABC, CBS, FOX, and NBC, along with American Forces Network, Bravo, Cooking Channel, Discovery Fit & Health, E!, Encore, Encore Espanol, EPIX, ESPNews, FOX Sports 2, FXM, HBO, HBO Latino, ION Television, Lifetime Movie Network, Logo TV, MLB Network, National Geographic Channel, Oxygen, Palladia, Pivot, SHOWTIME, Smithsonian Channel, Starz, TNT and VH1 are donating one hour of simultaneous commercial-free primetime for the nationally televised fundraising special on Friday, September 5, to be broadcast live from the Dolby Theater in Los Angeles. “Cancer profoundly touched my life when I lost my father to the disease twelve years ago, and Stand Up To Cancer gives me a powerful platform to fight for a cause that I’m passionate about,” said Paltrow. “I am thrilled to join Joel Gallen to executive produce the Stand Up To Cancer telecast again this year, and honored to continue standing up in my father’s memory,” she said. This star-studded appeal will continue to build public support to accelerate the pace of groundbreaking translational research that can get new therapies to patients quickly to save lives and make cancer patients long-term cancer survivors. SU2C brings together scientists from different disciplines across institutions and international boundaries to work collaboratively on promising new treatments that will impact a wide range of cancer types. For the first time, there will be a Canadian co-broadcast of the 2014 telecast presenting Canada-specific content, which will air simultaneously on all four major English-language Canadian networks: CBC, City, CTV and Global. All funds received from the Canadian general public during the Stand Up To Cancer Canada broadcast will be directed towards the creation of collaborative research teams, as well as education and awareness programs conducted in Canada. The legendary film producer Laura Ziskin, who was a co-founder of SU2C, executive produced the first two telecasts in 2008 and 2010. Ziskin lived with breast cancer for seven years before it took her life in June of 2011. Talent participation in the 2014 SU2C broadcast will be announced throughout the summer. 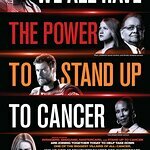 Past participants in the SU2C broadcasts include: Jennifer Aniston, Christina Applegate, Halle Berry, Beyonce, Jessica Biel, Jack Black, Mary J. Blige, Josh Brolin, George Clooney, Coldplay, Katie Couric, Sheryl Crow, Matt Damon, Ellen DeGeneres, Dana Delany, Michael Douglas, Kirsten Dunst, Melissa Etheridge, Jimmy Fallon, Fergie, Jennifer Garner, Charles Gibson, Tom Hanks, Salma Hayek, Marg Helgenberger, Kareem Abdul-Jabbar, Samuel L. Jackson, Ken Jeong, Scarlett Johansson, Minka Kelly, Alicia Keys, Jamie King, Lady Antebellum, Jay Leno, Tobey Maguire, Martina McBride, Tim McGraw, Jillian Michaels, Jim Parsons, Keanu Reeves, Jeremy Renner, Rihanna, Julia Roberts, Robin Roberts, Seth Rogen, Ray Romano, Adam Sandler, Diane Sawyer, Ryan Seacrest, Will Smith, Emma Stone, Eric Stonestreet, Meryl Streep, Alison Sweeney, Taylor Swift, James Taylor, Justin Timberlake, Carrie Underwood, Sofia Vergara, Denzel Washington, Forest Whitaker, Brian Williams, Reese Witherspoon, Stevie Wonder, Renee Zellweger, the late Patrick Swayze and others. “When we launched Stand Up To Cancer, our goal was to approach the struggle against cancer in a different way. Just six years into this movement, the incredible generosity of our donors — of every level — has enabled major progress in developing new treatments,” said Katie Couric, a co-founder of SU2C. “This program offers a unique opp‎ortunity to share the story of our progress and to remind viewers that each and every individual can play a role in supporting these scientists and their tireless work on behalf of patients,” she added. “None of SU2C’s groundbreaking research accomplishments would have been possible without the ongoing support of the entertainment industry,” said Sherry Lansing, also a co-founder of SU2C, as well as founder of the Sherry Lansing Foundation and chair of the Entertainment Industry Foundation’s Board of Directors. "From the network and cable executives donating unprecedented “roadblock” airtime, to the hundreds of stars who volunteer their time and talent to help us engage the public in this effort, we are profoundly grateful to the entire entertainment community and humbled by the impact that is possible when we unite in support of a cause that affects us all," she said. One in two men and one in three women in the U.S. are expected to be diagnosed with cancer in their lifetimes, and almost eight million people worldwide die from cancer every year. Work by SU2C-supported researchers has led to approval by the U.S. Food and Drug Administration (FDA) of a new combination treatment for pancreatic cancer, as well as FDA “breakthrough therapy” designation — intended to expedite development of especially promising medicines — for a new breast cancer drug. “Stand Up To Cancer could not have made such rapid progress towards improving patient care and saving lives without the unparalleled commitment of our major donors,” said SU2C co-founder Rusty Robertson. “They’ve believed in SU2C’s collaborative funding model since the outset, and have played a critical role in helping grow SU2C’s movement. We couldn’t be more grateful,” added SU2C co-founder Sue Schwartz.